What do you do when you are faced with something that is an unbearably adorable? There is little recourse but to fall head over heels for it. For many people the object of adoration may be a puppy, a kitten, a small fat chirping birdie, or some other cuddly animal. 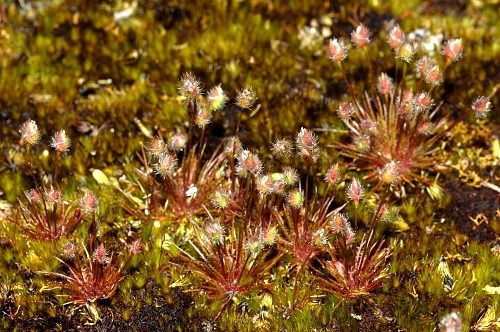 Seldom have plants been viewed as cute or adorable. Yet everytime I encounter a plant in turfed perfection (being small accentuates this), with scapes of flowers or fruits pointing heavenwards, I start experiencing a fluffy feeling inside similar to that a kitten evokes in me in it performs it’s cutest antics. I’d call this the unbearable adorableness of turfed existence. 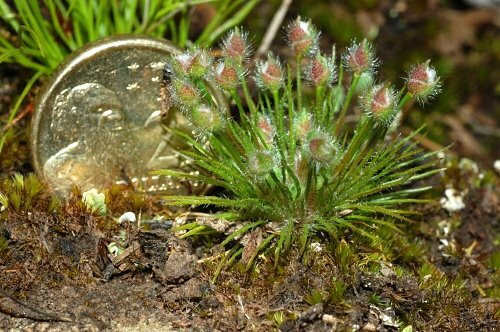 One of the many plants that fall under such a category is the Hairy Bristlewort (Centrolepis strigosa) (Just so you can have a feel for how small bristleworts can get, the picture above was taken with a $2 Australian coin which is roughly 2 cm in diameter). I made my first acquaintance with this common plant a year ago in the Northwest part of the state and I have been finding it everywhere since. But everytime I see this little plant I cannot help but want to take a picture. 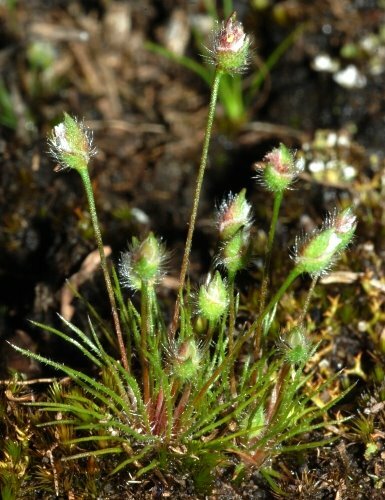 This entry was posted in Common and Unappreciated, Plant Appreciation, Plant Morphology and tagged Bristlewort, Centrolepidaceae, Centrolepis, Centrolepis strigosa, hairy bristlewort, small plants, turfed plants. Bookmark the permalink.